Mitsubishi Heavy Industries Engine & Turbocharger, Ltd. (MHIET), a Group member of Mitsubishi Heavy Industries, Ltd. (MHI)(TOKYO:7011), has delivered two MGS (Mitsubishi Generator Series) diesel generator sets for backup emergency use at Intercontinental Shanghai Wonderland, a hotel opened on the site of an abandoned quarry in the Songjiang District of Shanghai. The delivery was made through the Group’s Chinese subsidiary Mitsubishi Heavy Industries (Shanghai) Co., Ltd. (MHISH) to Shimao Group, a major property development firm for Intercontinental and Hilton Hotels in China. This is the fifth delivery of MGS sets to the company for a cumulative total of ten units, reflecting the high reliability of Japanese quality and the product appeal. 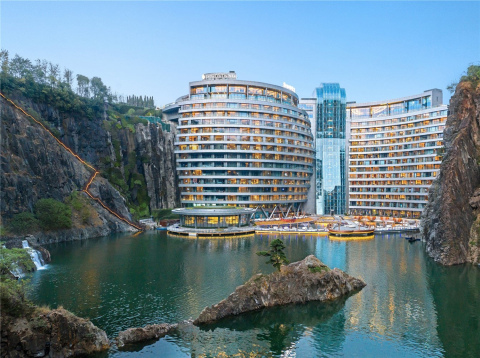 Intercontinental Shanghai Wonderland is a five-star resort hotel built into a huge 90-meter deep quarry, with two above-ground floors and 16 floors below ground level. Construction took over nine years. The hotel has 336 guest accommodations including rooms below the water level with views of tropical fish, as well as facilities that make full use of the deep quarry, including an underwater restaurant, balconies with spectacular views of waterfalls, and a cliff slide. The two newly delivered units (MGS1200B) each have generating capacity of 1,000 kilowatts (kW). MGS systems incorporate diesel engines manufactured by MHIET in Sagamihara, Japan, together with generators and auxiliary equipment from Mitsubishi Heavy Industries Engine System Asia Pte. Ltd. (MHIES-A) in Singapore, and MHI Engine System Vietnam Co., Ltd. (MHIES-V) in Vietnam. They are widely used as stand-alone generators on islands and at other locations where construction of large-scale power plants is difficult, and for backup emergency use in buildings. Owing to their quality and reliability, MGS systems have been extremely competitive in Asian markets compared to American and European models. The two newly delivered units were manufactured by MHIES-V. In China, stable economic growth is driving a wide range of construction projects, from data centers to large-scale factories and commercial facilities, both in metropolitan areas such as Beijing and Shanghai, as well as regional cities. Accordingly, demand for backup emergency power systems in these facilities is also growing. Going forward, MHIET, together with its parent company Mitsubishi Heavy Industries Forklift, Engine & Turbocharger Holdings, Ltd. (M-FET), will prioritize China as an important market for MGS diesel generator sets, and seek expansion in new orders on the strength of these systems’ exceptional track record. We will also focus on improving after-sales service for previously supplied units, in order to further increase sales. About Mitsubishi Heavy Industries Engine & Turbocharger, Ltd.
Mitsubishi Heavy Industries Engine & Turbocharger, Ltd. (MHIET) is a 100% subsidiary of Mitsubishi Heavy Industries Forklift & Engine Turbocharger Holdings, Ltd., and was inaugurated on July 1, 2016 to take over the MHI engine and turbocharger businesses. Mitsubishi Heavy Industries Engine & Turbocharger offers a diverse lineup of turbochargers that enable land, sea and generator engines, energy and engine turbocharging, contributing to the realization of secure and comfortable daily living and protection of the environment. In addition, in order to gain the trust of customers, MHIET delivers a comprehensive set of services from development and manufacturing to after-sales service for its high-quality products based on its technical capabilities built up over many years. Please refer to the website for more information about MHIET. MHI Compressor Corp. Establishes Local Subsidiary in South Korea Through Joint Venture with Mitsubishi Corp.
ST Aerospace Systems Pte Ltd.